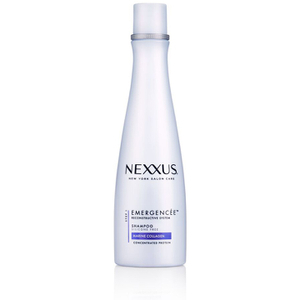 Revitalise your hair with the Emergencée Shampoo from Nexxus; a silicone-free shampoo, enriched with kind-to-hair ingredients, that targets damaged and sensitised hair. The shampoo cleanses your hair, and also rebuilds any broken protein structure from daily damage. Formulated with a Marine Collagen that enhances shine in the hair and 100% Pure Elastin Protein that works to rebuild damaged follicles, the Emergencée Shampoo rebalances hair and replenishes nutrients. Hair is left fresh, light and fluid. – E.W.